The changes in UK religious demographics have brought about a new set of challenges for retailers in recent years. Stories of Muslim employees refusing to sell alcohol and pork products whilst working for non-religious supermarkets are not uncommon. Back in 2016 I also reported on taxi drivers refusing to take passengers with guide dogs for ‘religious reasons’. This ended in perpetrators being fined for breaching equality laws. It’s no shock to hear of people making unreasonable requests due to their faith, it’s just surprising to me when their employers say “yes”. Businesses are free to set their operating rules and tweak them however they see fit of course. And I believe a good employer is one that is accommodating of its staff’s needs – where they are reasonable and balanced. For instance, I can foresee no reason why an employer would want to ban religious headdress, or prevent a staff member from using a spare meeting room to pray on their break etc. This isn’t about making people unhappy, it’s about ensuring all employees are treated fairly. It’s also about fulfilling your job description and its related duties. If your beliefs prevent you from doing that, then it is your beliefs that must take a backseat, not the business model. When we move into the realm of placating religious dogmas, it becomes a tricky area as well as a slippery slope. Especially when it is to the detriment of service. This is also in clear conflict with the job description attached to the employment contract they signed. How do this gentleman’s colleagues feel, having to pick up the slack of processing more customers? 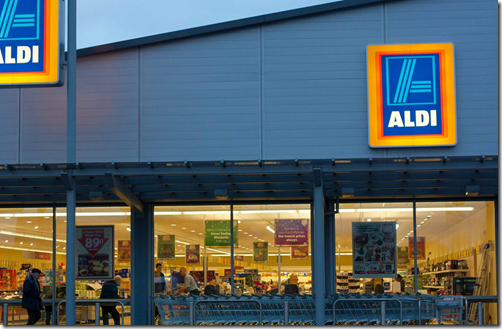 I wonder how accommodating Aldi would be of a vegetarian employee requesting to forgo the sale of meat? If this does turn out to be an accommodation of religious belief, it demonstrates a clear reduction in service in favour of upholding conservative religious dogmas. It is religious privilege in the workplace masquerading as progressivism. This is hardly the most important struggle of our day, but religious privilege must be challenged in all its forms. Religious dogmas should be brought in line with 21st century British trading norms – not the other way around. I don’t hope for religious people (or anyone) to be persecuted in the workplace. I just expect them to do the job they are paid for. Like everyone else. I have reached out to Aldi for comment and will update this story with any new developments. I hate seeing this unfair accommodation. I was refused service from an Uber driver because of my dog, but I didn’t lodge a complaint. I hadn’t told the driver she is a service dog, so he was within his rights to turn down the fare. Next time I’ll specify she is a registered service dog (she actually is), and will take action if I find that situation again. I have a Muslim colleague who won’t shake womens’ hands. It’s to ‘preserve his modesty and chastity’ apparently. It’s incredibly insulting, but everyone accommodates it for fear of a racism accusation. This is the British workplace in 2017. This is not only workplace. It’s they ridiculous choices we haveade throughout Europe during this “humanitarian” trend, and the beginning of the end for our continent’s civilization. I’m afraid I think this is just bloody ridiculous. If I worked in a book shop could I refuse to serve people with the bible or the Koran because of my “deeply held” atheist beliefs? If employees were being forced to drink the alcohol i would have some sympathy but they’re not. If it means so much to them how can they work in a shop that sells alcohol at all? Show me where the scripture says you shouldn’t drink alcohol – or serve it to someone else – but it’s OK to work for some one who sells it? Basically, their religion is soooo important to them that they are willing to inconvenience the customers – but not themselves. Hypocritical virtue signalling – sack them. exactly ! I also resent capitalising the abbreviation IS. “is” (with double quote) should be more appropriate. There is absolutely no reason why these terrorists should be referred to with capital letters. It’s getting ridiculous now this is Britain, all these other faiths pushing their beliefs onto everyone to accommodate them. So does this mean if they can’t serve alcohol to paying customers they will not serve any customer with pork / bacon in their shopping baskets, or vegetarians / vegans picking and choosing who to serve or staff with nut allegies not serving customers with nuts etc…come on ! I worked for sainsburys for nearly ten years and done my job regardless what I got added to do . Companies are letting the employees run the businesses now I’m all for looking after staff but this is getting out of hand . How far does it go on the employee’s “interpretation” of what they can and cannot do? So it looks like this may have been someone saying they can’t sell alcohol on behalf of the company even though the main objection is not to ingest it. But no questions asked. What if another employee went a bit further and started scrutinising the contents of eg mouthwash, or medical products or anything else, and declared to the customer that because it contains alcohol, they must find another checkout? Or maybe the supermarket asking the customers to scrutinise the ingredients of their hair products in case they contain alcohol, because there is a very, very conservative religious person sitting at a checkout? It seems ridiculous, but so does this. 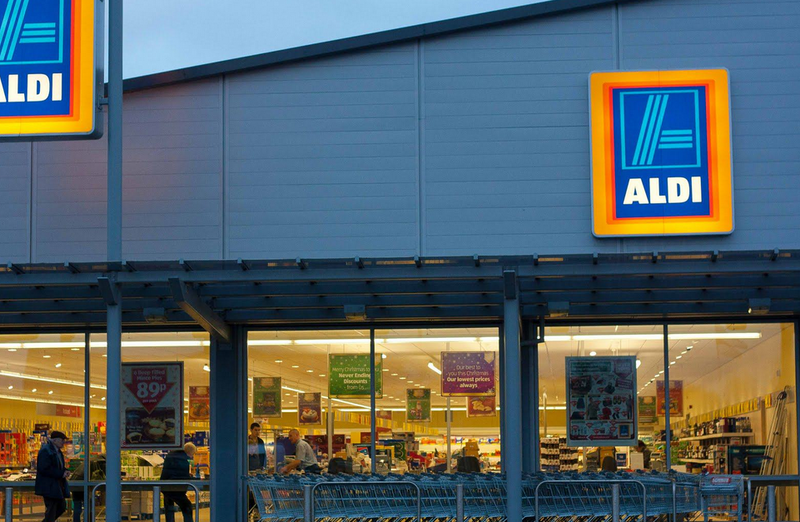 I’ve only tired Aldi a few times and their checkouts always have huge queues and are not worth the bother. But this will add to the queues, as I suspect, some just nip in, in order to get cheaper booze……. Great article. Excellent comments above me too. What happens if the customer has pork products in their basket? 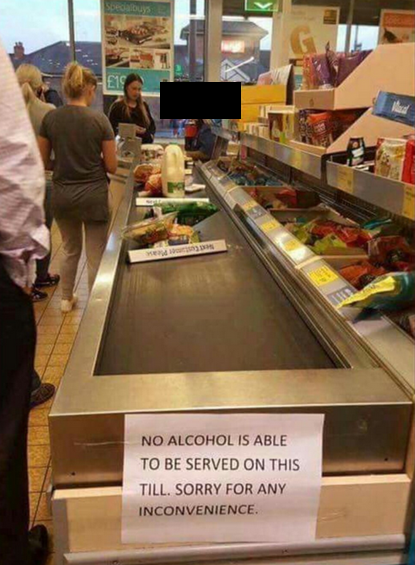 It is not like the employee has to drink the alcohol he/she sells. If one cannot handle the merchandise that is offered in the store than maybe one should look for another job. Or another continent would be better. So what about your local corner shop run by Muslims who sell alcohol & cigarettes? You don’t hear of any of them complaining g as it’s lining their own pockets. As someone mentioned above..it isn’t ‘all’ these religions…just one particular ideology that pervades every facet of their lives and it seems we now have the thin edge of the wedge. It will seep into our own lives bit by bit and our MPs will silently smile and just move on. It is a huge appeasement to one 5% segment of the community and it is indicative of the future of Britain. In my view, this should have not been sanctioned…if, as I believe, it is for religious reasons. The logical extensions of the ramifications of their creed is a very slippery slope and we are on it already! This insidious creeping has to stop. This was not well done Aldi at all. I note that there is not one comment in favour above mine. Aldi would do well to check these out… from the other 95%! Total hypocrisy, the pork is in a package and the alcohol is in a bottle so this individual is not coming into contact with either of these products. I have been served by a Pakistani Muslim in Sainsbury’s (he had the Islamic beard) who had no qualms about serving me with a bottle of whisky and a packet of pork pies. also, how many Pakistani Muslims or Muslims of Turkish or other ethnicity own off licenses in this country and handle alcohol on a daily basis? If there is any part of a job description that an individual cannot fulfil on the basis of race creed or religion they should not be in this job. Shops are not religious organisations. Are British Christians allowed to refuse to serve Halal certified products? I’d bet that they would soon be dismissed if they did. 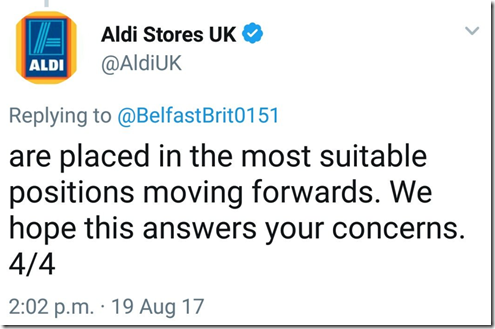 Aldi should show some guts and dismiss this individual. There are many thousands of people out there who could perform this task without any religious sensitivities and without causing offence to us native Brits. This country is going down the Moslem drain -if your religion forbids you to handle/sell pork/alcohol, then common sense should tell you not to go and work there…if you’re a non-Christian, you must fit in with our culture, NOT the other way around! Of course the more in number they become the more in their religious demands must be met. Their religion is based on pleasing their God by their “works”. So any sin they commit is blameable on temptation, not on them personally, but on their environment. You are to blame for their temptation. When they become overwhelmed with all the sinning against Allah, to assure themselves of their “rewards” they then go on their Jihad to die for Allah and their Caliphate to redeem themselves. 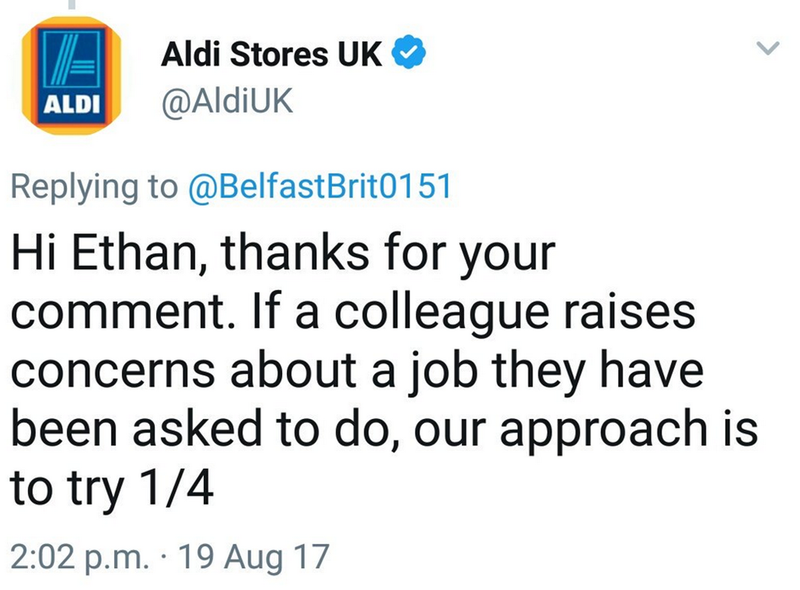 Yes, Aldi should consider replacing/not hiring an employee who does not wish to handle alcohol/pork for religious reasons. 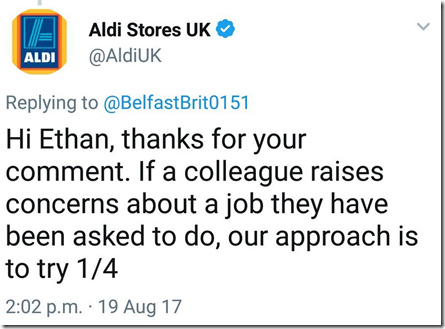 It must be understood that it would be considered most unfair of Aldi to even to think of asking an employee who did not wish to handle those items, to do so as part of their job. Therefore, best not to hire them in the first place. 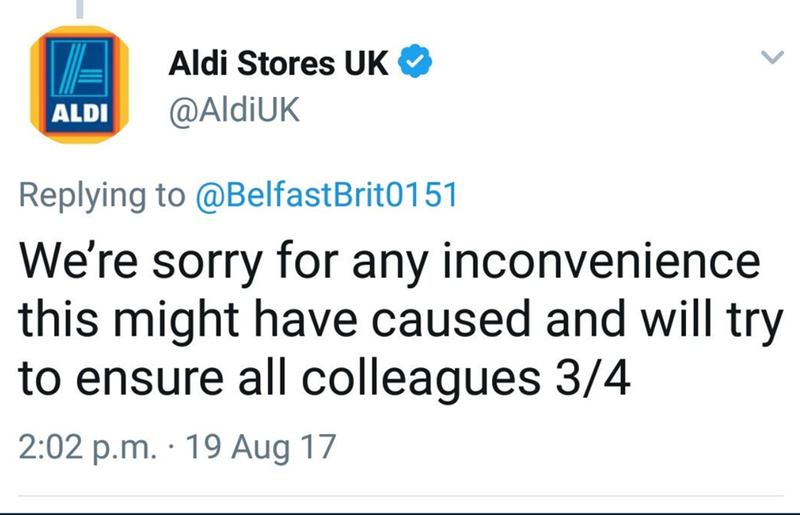 Aldi took wrong decision. Take off that sign!! If the employee does not want to serve alcohol or foods that are not allowed in his religion then his problem only. . It does not become a customer problem. He should have not applied for the job in first place. 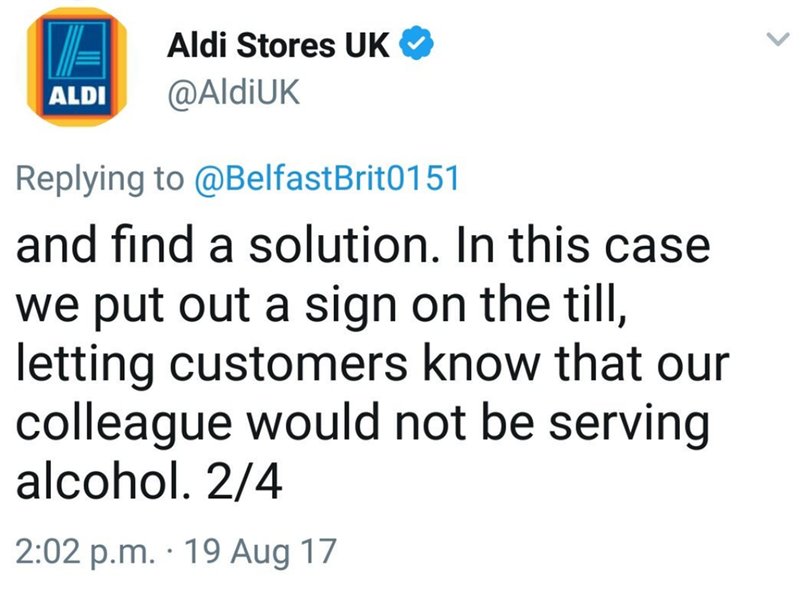 Aldi like other supermarkets sells alcohol,so if for whatever reason you do not want to handle alcohol you do not apply for a job there. It’s common sense. Full stop. Aldi management could have offered the person to do something else that day.. If not then he gets sent home. He refused to do his job. 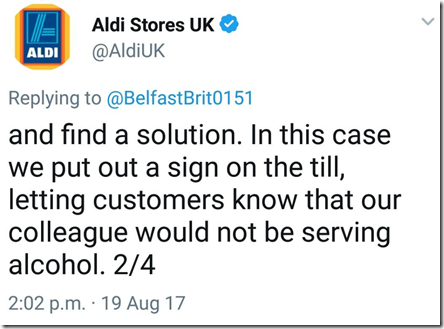 Probably Aldi does remember about the 2010 case in which a guy refused to handle alcohol in a other supermarket. The supervisor told him clearly do you task or you go home. The guy was able to sue the supermarket for unfair dismiss and won the case in court. I’d love to sue the idiot judge!! 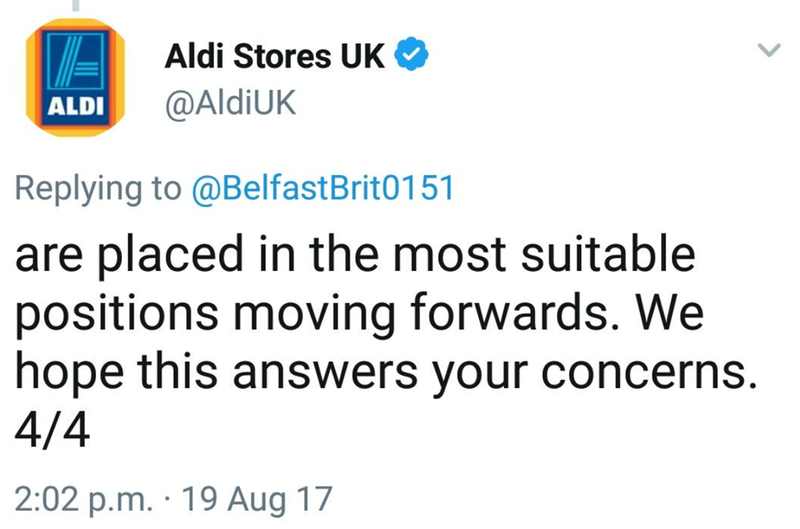 So probably Aldi did not want to go down that path. Well what could we expect in the future? Pork food items taken off the shelf because they might desturb the religion of the staff?? Please!! I’m all for workers rights but not when it comes to this stilly little things that really do not matter. 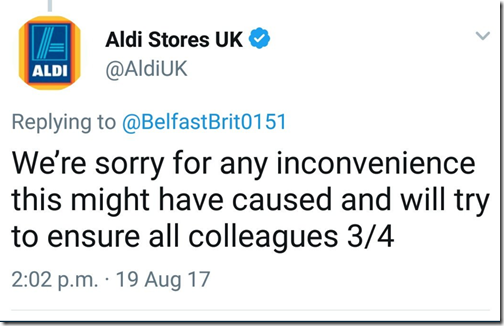 Maybe Aldi should focus on paying their staff a bit more and make their working conditions better and less stressful. If an employee does not want to sell what supermarket does sell due to religion reasons or other personal reasons (being a vegetarian or vegan) that’s his problem only. Where I used to work until few months ago I had a guy working in the kitchen as chef and in the morning he was preparing become and sausage sandwiches, ham sandwiches for lunch or roast pork, he never once complained. He even was working in the evening on Thursday and Fridays at out internal pub and serving alcohol. This is called accepting the job duties you have applied for. Not happy for whatever reason? You give your week or month notice and you go. Nobody forces you to work in a facility that sells pork or alcohol if you are a Muslim and allow your religion to dictate even your job duties. It is common knowledge also that alcohol is produced and consumed in Turkey, but below is a real revelation. Therefore as I said before, this is total hypocrisy. 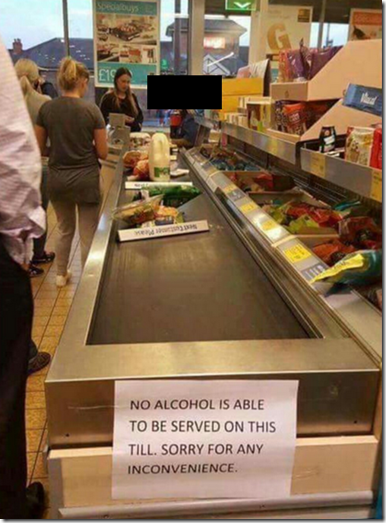 No Muslim should be allowed to refuse to serve alcohol when it is being produced in a strict Islamic country. Do they brew the beer, refuse to serve it to one another, refuse to drink it, and only export it to Western countries? Muslims must handle this at all stages of production. In New Zealand it is unlawful for most businesses to open on Good Friday and Easter Sunday – essentially only food outlets, gas stations and businesses with exemptions to cater for tourists are permitted to trade on those “holy” days. Other businesses can be prosecuted and fined if they open. Many ignore the ban and trade regardless, because of the substantial public demand for goods and services on those days. New Zealand is a largely secular society, but its shop trading hours legislation remains a Christian relic. It is controversial every year. So it’s not just the religious peculiarities of Muslims that interfere with the ability of the general public to shop – the peculiar sensibilities of Christians do too. Neither is a good thing for the rest of us.